Sixteenth-century collectors had a passion for the freshness and spontaneity of drawings. To capitalize on these tastes, Ugo da Carpi pioneered the chiaroscuro woodcut in Italy. In this method, multiple blocks are cut and inked with different colors so the resulting print resembles a pen-and-ink sketch. 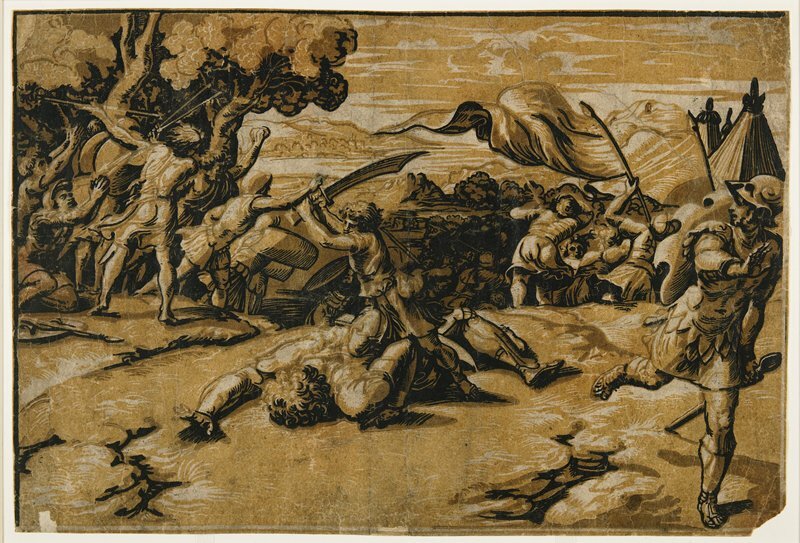 Ugo's subject, based on a design by Raphael in the Vatican, shows young David's triumph over Goliath, to the dismay of the fleeing Philistines. Renowned for his technical virtuosity, Ugo set a trend with his chiaroscuro woodcuts, which would captivate European connoisseurs for centuries.